Kotap has spent the last two years of his life locked up in a box, listening to the world outside go by. When he was discovered, all he had for company was a plastic bottle and a straw. His only visitor was the man who kept him locked up. But now he has been set free from his one square metre box. Kotap is four years old and he was saved by the International Animal Rescue in Borneo. 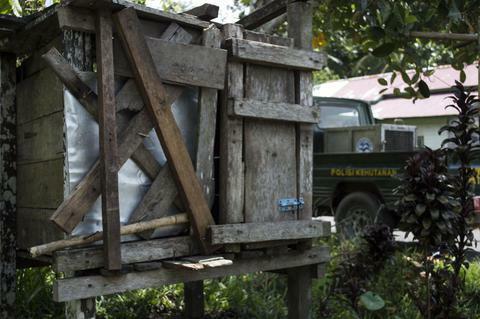 ‘His captor, a man named Baco, claimed to have been given the orangutan by some people he met in the village of Ketapang. ‘Baco had spotted the small baby ape in a cardboard box and agreed to take him home and look after him. However he soon became concerned that Kotap would disturb the neighbours and so built a cage for him at the front of his house. ‘He had fed Kotap on a diet of human food, including bread and rice. Baco claimed that the orangutan’s favourite meal was uncooked instant noodles, washed down with a sachet of sugary drink. ‘Officials from the forestry department (BKSDA) had visited the man in his home in Rabak village on a previous occasion but been unable to persuade him to surrender Kotap. ‘However, by taking the time to talk to him and explain the desperate plight of orangutans in Borneo, they convinced him that he must act in the best interests of the animal – and in compliance with the law – and hand Kotap over. ‘When the door of the box was opened and vet Uwi extended her hand to Kotap, at first he was frightened and ran to the back of the box where he couldn’t be reached. Uwi said: ‘Kotap was very stressed by all the strangers who gathered to see him when he was taken out of the box. He became nervous and aggressive which is not surprising. 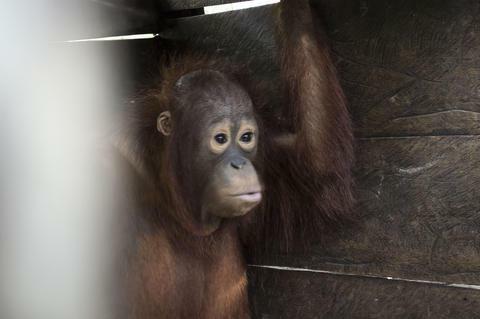 Alan Knight, Chief Executive, said: ‘This poor orangutan had been kept alone in the dark for two long years. ‘He was deprived of everything that an orangutan needs to survive in the wild. At four years old, he should still be with his mother, learning from her how to climb and move through the forest, what foods to eat and what to avoid, and how to build a nest in the trees to sleep in each night. Karmele Llano Sanchez, Programme Director, said: ‘It’s high time people realised that, if they keep breaking the law by capturing orangutans and keeping or selling them as pets, then the species will soon become extinct.